TOKYO (AFP, REUTERS) - A US F-15 fighter jet crashed off the southern coast of Japan on Monday (June 11), local media reported, adding that the jet’s pilot ejected and was rescued by Japanese forces. US Forces Japan confirmed the incident, which happened during a routine training mission. 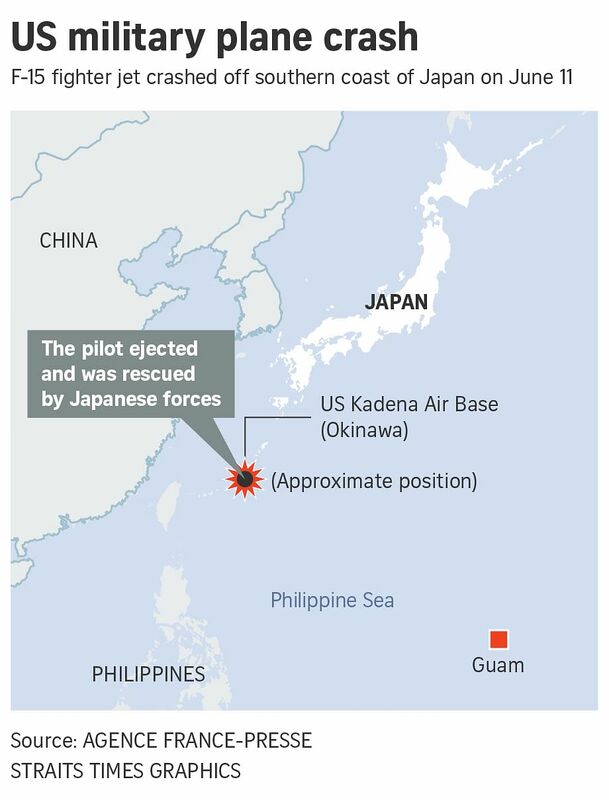 The Kyodo news agency said the jet belonged to the US Kadena Air Base and crashed early Monday morning about 80km south of Naha, the regional capital of Japan’s southern Okinawa island. Japan’s NHK television station said the rescued pilot suffered a broken leg. Kadena is the largest US military base in Japan, which hosts around 47,000 American troops under a decades-long security alliance. A series of accidents involving US military aircraft has stoked tensions, and, in January, US Defence Secretary James Mattis apologised to his Japanese counterpart over the incidents. Residents in Okinawa, which hosts the bulk of American troops in Japan, have protested against the deployment of Ospreys because of repeated accidents. A series of crimes by US personnel, including rapes, assaults and hit-and-run and drink-driving accidents, has also triggered protests on Okinawa, and is a frequent irritant in relations between close security allies Japan and the United States.